Haskell Creek, where it runs through lovely Sepulveda Basin Wildlife Reserve, hosts many riparian trees and shrubs, such as cottonwoods and willows. Songbirds forage and nest in the trees, while egrets and herons fish in this heart of the Wildlife Area. Sadly it is infested with trash, especially plastic bags, foam cups and food containers. 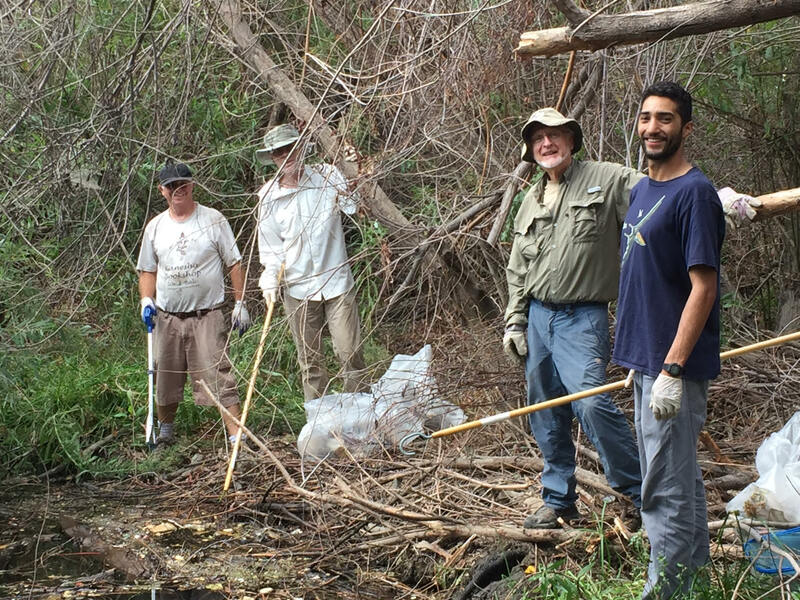 Please help clean up the mess, restoring our creek! Equipment and Clothing: You will get muddy and maybe wet. Please wear rugged clothing and shoes or rubber boots. If you have them, bring work gloves and long-handled tools to reach trash. Directions: The Wildlife Reserve is on the east side of Woodley Ave. about a half mile north of Burbank Blvd. Turn east at the sign for the Japanese Garden (6100 Woodley Ave., Van Nuys, CA. 91406), stay to the right, and follow Wildlife Way beyond the archery range for about a half mile to the last parking area. Meet: at amphitheater behind the rock-faced buildings. More Information: The event is appropriate for adults and older students. Students can get certificates and earn community service hours. Rain cancels. Questions: 310.457-5796 (Muriel) or 818.998-3216 (Diana).